This Classic Bowie Knife really takes you back to the days when most men in a western town could be seen with a blade sheathed on their hip. It is a beautiful example of the blade design originally commissioned by famous frontiersman Jim Bowie. 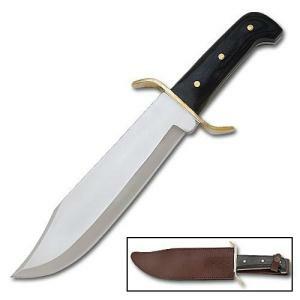 The Bowie knife was thought up as a multi-purpose hunting, fighting, and camp knife. Using this 10" stainless steel Classic Knife, I will explain a little about the various design functions. A major purpose of the Bowie knife was as a weapon of battle. Like a mini-sword, the Bowie knife was often used in tense close quarters combat. The clip point with a false edge was often sharpened and used in methods akin to saber fencing, for a back slash or back cut. The S-shaped guard, especially the forward slant on the top, was intended to deflect and protect from blows during corps-a-corps. As for hunting, the curve of the edge near the point serves for separating the skin from an animal carcass. The long, straight portion of the blade is for slicing, carving, and cutting. The Bowie knife was used for all sorts of thing in camp. The popular saying goes that a Bowie knife should be kept razor sharp for shaving; heavy enough to use as a hatchet; and wide enough to use as a paddle. This Classic Bowie is a beautiful knife. It would go great in a collector's case, but is not necessarily made for collecting purposes. The handle is a dark solid wood, with a solid brass guard and pommel. Not that many people carry Bowie knives anymore, but you could carry this one if you wanted and it would do terrifically. A leather sheath is included.